Meigs junior Nick Lilly (10) steps back for a jump shot during the Marauders 40-31 loss to Ironton, in the Newt Oliver Coaches Classic on Saturday in Rio Grande, Ohio. 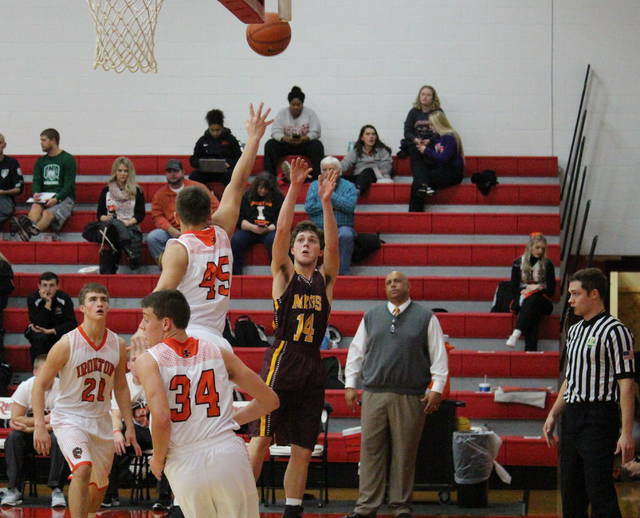 Marauders junior Cooper Darst (24) tries for a reverse layup during Meigs’ 40-31 loss to Ironton, in the Newt Oliver Coaches Classic on Saturday in Rio Grande, Ohio. RIO GRANDE, Ohio — Too many second chances and too many three-pointers. 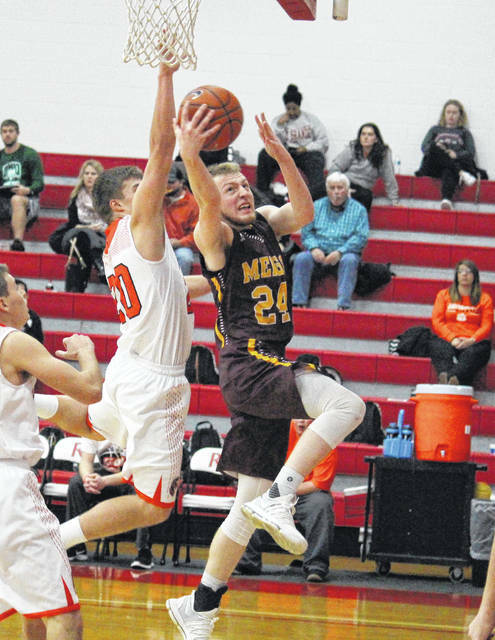 The Meigs boys basketball team allowed non-conference foe Ironton to hit seven trifectas and grab 14 offensive boards, as the Fighting Tigers battled to a 40-31 victory in the finale of Saturday’s Newt Oliver Coaches Classic in Gallia County. Ironton (1-1) scored the game’s first four points, but the Marauders (0-4) ended the first period with a 8-1 run and a three-point advantage. The Fighting Tigers sank three straight trifectas to start the second quarter, holding Meigs off the board until the 2:29 mark of the period. The Marauders outscored IHS 5-2 over the final 2:29 of the first half, trimming the Orange and Black lead to 16-13 at the break. Meigs trimmed its deficit to just one point, at 18-17, with 5:50 left in the third, but Ironton finished the quarter with a 9-6 spurt, stretching the margin to 27-23 with eight minutes to play. The IHS advantage was cut back to one possession, at 27-25, within the opening 10 seconds of the fourth quarter, but the Fighting Tigers answered with a trifecta at the 7:00 mark. Just 20 seconds later the Maroon and Gold hit a triple of their own, but Ironton ended the game on a 10-3 run, sealing the 40-31 victory. “We have a hodgepodge lineup out there and the kids gave a valiant effort,” fourth-year MHS head coach Ed Fry said. “I know Ironton is hurting too, but they’re athletic and they’re strong. We knew going in that rebounding was going to be a critical thing, since both of us were kind of beat up. For the game, Meigs shot 12-of-38 (31.6 percent) from the field, including just 1-of-14 (7.1 percent) from beyond the arc. Meanwhile, Ironton shot 12-of-43 (27.9 percent) from the field, including 7-of-19 (36.8 percent) from deep. From the free throw line, the Marauders were a perfect 6-of-6, while the Orange and Black were 9-of-11 (81.8 percent). The Fighting Tigers won the rebounding battle by a 27-to-22 clip, including 14-to-7 on the offensive end. Meigs committed 14 turnovers in the tilt, two more that Ironton. The Marauders claimed the game’s lone rejection and held a 9-to-7 edge in assists, while IHS claimed a 7-to-4 advantage in steals. 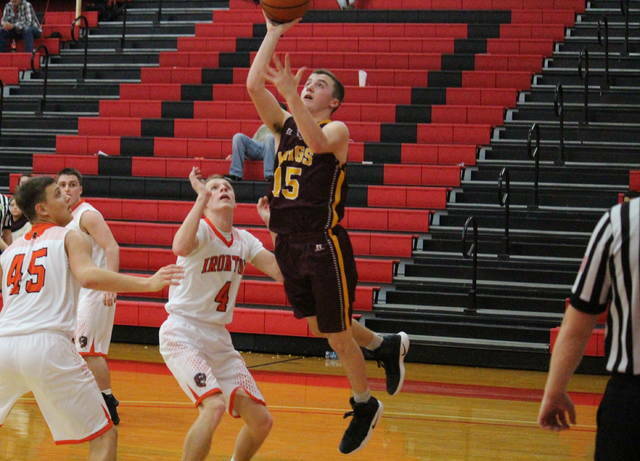 MHS junior Cooper Darst led the way for the Maroon and Gold with 15 points, followed by Jake Roush with seven. Zach Bartrum marked five points in the setback, while Bobby Musser scored four. Musser pulled in a team-best eight rebounds, while Roush grabbed four boards for Meigs. Nick Lilly dished out a game-high four assists, Roush came up with two steals, while Musser blocked a shot. Ethan Wilson led the victors with 18 points, followed by Kyle Adkins with eight. Reid Carrico and Trent Milleson scored five points each, Joel Blankenship chipped in with three points, while Ayden Barnes had one point in the win. Carrico pulled in seven rebounds to lead IHS, while Wilson and Hunter Humphreys earned two assists apiece. Wilson led the Fighting Tiger defense with three steals. 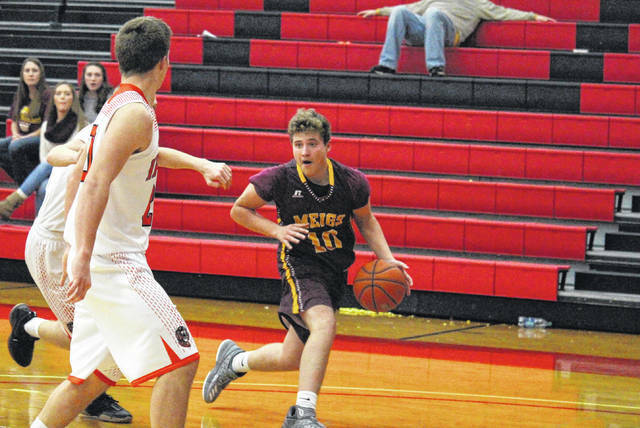 Meigs has been without starters Christian Mattox and Weston Baer for back-to-back games, and the Marauders will begin Tri-Valley Conference Ohio Division play when they return to action on Tuesday at Athens. This was the lone scheduled meeting between the Marauders and Fighting Tigers this season.